I can't believe the Gingerman has been in it's Norfolk Square home since 1998. It's always been the quiet older sibling of the rest of the group (which includes the Ginger Pig, Fox and Dog) and perceived as being more reserved and grown up. Which may be why my young, sprightly self *cough cough* has always made use of the other restaurants, not that I don't think a prim and proper restaurant doesn't have it's place. But the Gingerman has just emerged from a bit of a face lift which has seen a new brand, new fit out and a change of layout to communal seating. Even a new head chef. I don't think any of this would really deter the former clientele, just help to attract some fresh custom. Personally, I'm a big fan of it all, it seems to sit very well with what a modern, solid, quality restaurant should look like. And after a taste of the menu at the press launch, I can also vouch for the food. 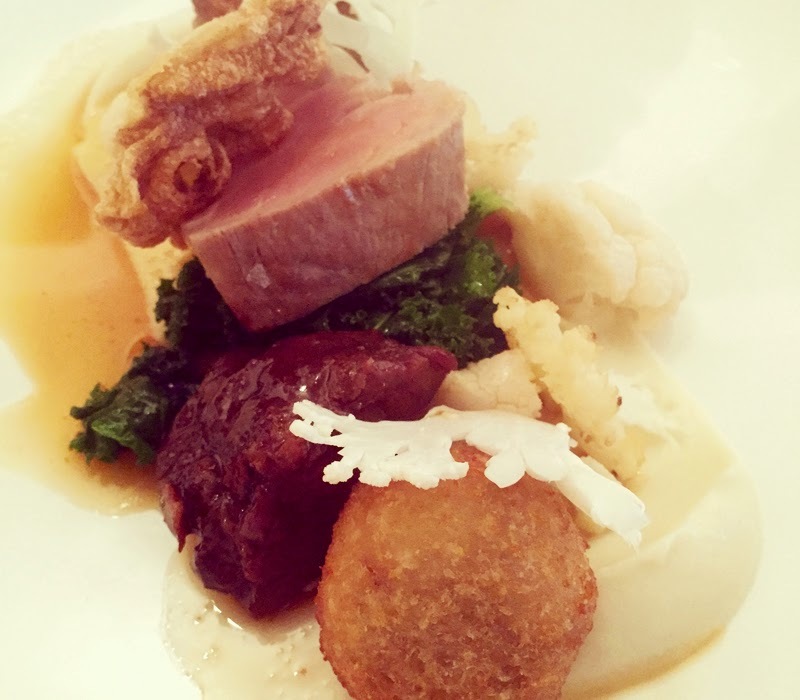 I am right on board with owner Ben McKellar's ethos for real food, cooked elegantly. He clearly knows his customers and wants to feed them well yet make a good impression on the plate. I think it's very easy to get carried away with overly fussy food and process, leaving you with something to admire visually but possibly not so enjoyable to eat. At the end of the day, if I don't leave a restaurant feeling like I've been fed well, then that restaurant has failed its job. They are NOT supposed to be art museums. Anyway, we started off on a very good foot with a silky cauliflower velouté, given a modern edge with an inspired bacon crumb (totally stealing this idea). 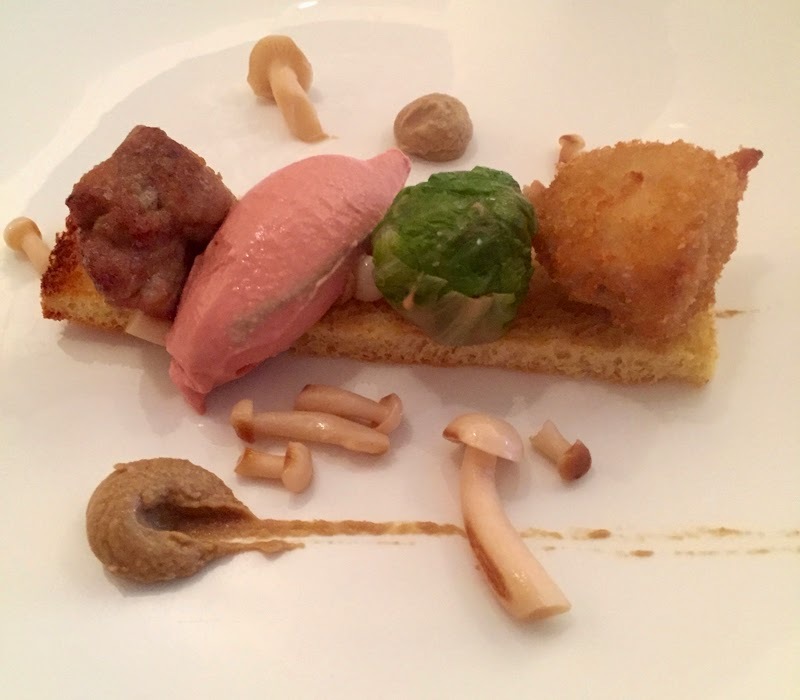 The starter was a great twist on the classic chicken liver parfait. Here you had breaded, boned chicken wings (the poshest KFC in town), a teeny chou farci (stuffed cabbage with chicken), silky sweetbread and mushrooms served on a honey brioche. 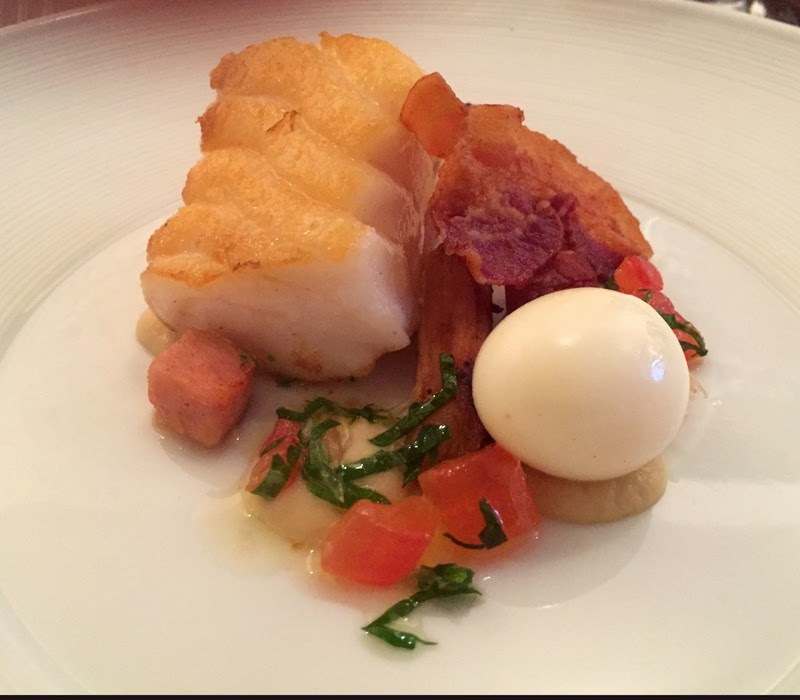 I can't eat scallops at the moment so mine were replaced with a lovely plump piece of cod for my fish course. As with the starter, everything had it's place on this plate with salsify, crisp bacon, quail egg, sauce verge and onion puree. Nothing shocking or showy, everything delicious. I think pork is one of the best meats to do a tasting plate with - so many cuts to celebrate! In this dish there were slices of tender pork fillet, a rich, savoury pork cheek which collapsed at the tap of the fork and a beautifully rendered cube of belly. Even the ear was crisped to crackling style. The raw or lightly pickled slithers of cauliflower looked beautiful and gave texture too. All our courses were matched with wines from Bibendum Wines. I'm no wine expert but can appreciate when they have been selected by people who are. Wines from Italy and New Zealand were joined by wine closer to home (from Bolney Estate up the road), but I must say my favourite was the sparkling Mocato d'Asti from the Italian Vietti estate. 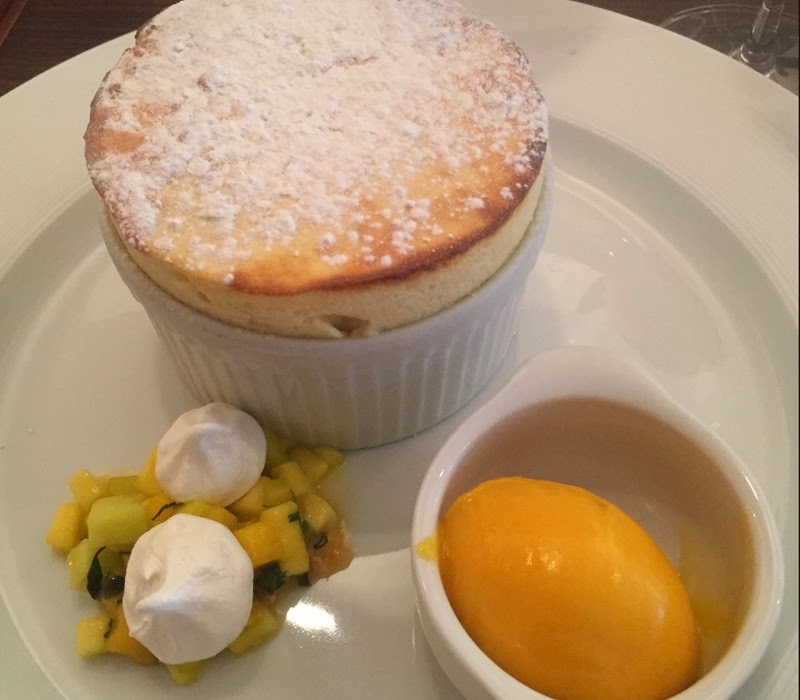 Sweeter than I normally go for in a sparkling but perfect with the impressive passion fruit soufflé and fresh mango, mint and passion fruit salad. I left with such a good impression of the Gingerman. It feels special without stuffiness and you leave well fed. Everything we ate is on the dinner menu, which I think is very good value at £32 for 2 courses and £37 for 3 courses. 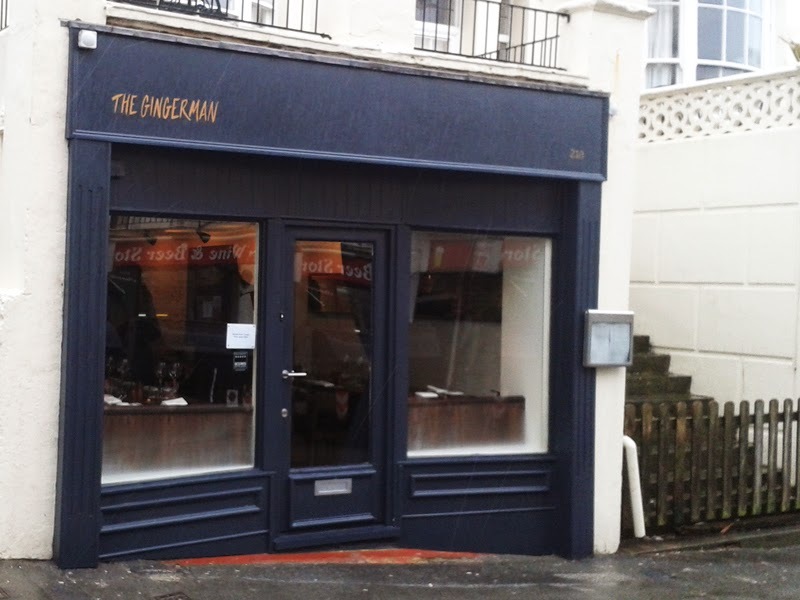 If like me you have overlooked the Gingerman in the past, or been swayed away to the bright lights of the latest shiny new restaurant opening in the city, think again as despite being one of the older restaurants in Brighton, there is plenty still fresh about it, particularly with a new spring in its step. In fact, it's going straight into my Black Book of Brighton Dining. I was invited to the launch. Opinion, as always, is my own. Pictures kindly from http://www.rosieposiespuddingsandpies.co.uk/ - after a technical malfunction my end!